FAO continues to push the lie of “planted forests”. The UN Food and Agriculture Organisation has long worked on behalf of the plantation industry. One of FAO’s strategies to support the spread of monocultures is to pretend that industrial tree plantations are forests. In December 2008, the Forest Products Journal published a report “Wood from planted forests: A global outlook 2005-2030”, written by Jim Carle and Peter Holmgren, two of FAO’s forestry experts. The report repeats the myth that plantations are forests, as if through repetition the myth will miraculously become truth. Carle and Holmgren appear to be so sure of their facts that they don’t bother reading anything that might contradict them. The literature cited in their report includes none of the large number of reports, articles or videos documenting the social and environmental impact of industrial tree plantations. Instead, they cherry pick their evidence from industry-friendly sources. “Planted forests have an important role,” Carle and Holmgren write, “in providing economic and social benefits in eradicating poverty in developing countries and in industrialized countries where marginalized groups and indigenous peoples have previously been excluded from the benefits of development processes.” Their source for this statement is a book published by the International Institute for Environment and Development (IIED) in 2005. A year previously, IIED produced a report about industrial tree plantations in South Africa, which came to a very different conclusion: “jobs provided by forestry contracting are not able to lift the vast majority of forestry workers, mainly women, out of chronic poverty, or prevent them from falling further into poverty.” Carle and Holmgren are aware of this report, or at least they should be. I sent it to them in June 2008 asking for a comment. As they did not reply, I sent it again in September 2008. But Carle and Holmgren have a simple strategy for dealing with anything that contradicts their predetermined conclusions: Ignore it. Carle does not say which countries he is talking about. Neither does he explain that the current expansion of industrial tree plantations is in the global South, to meet the over-consumption of the North. 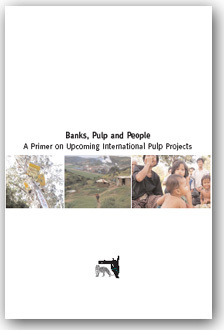 He does not describe the massive destruction of forests in Indonesia to feed pulp and paper mills. In recent years, Brazil’s industrial tree plantations have expanded faster than in most countries. Yet Brazil also has one of the highest rates of deforestation in the world. That does not mean that plantations are the cause of deforestation, rather that plantations have not relieved pressure on natural forests. When forests are cleared to make way for agricultural crops, as is the case in Brazil, it is difficult to see how tree plantations could possibly reduce deforestation. Surely, someone working for an organisation whose name includes the words “Food” and “Agriculture” should be able to grasp this? 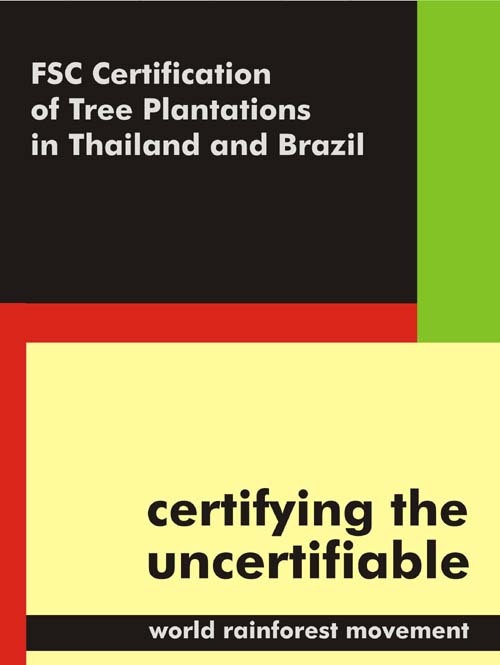 In September 2008, World Rainforest Movement’s Raquel Nuñez met FAO officials Jim Carle, Peter Holmgren and José Antonio Prado and handed them a statement titled “Monoculture tree plantations are not forests”. The statement, signed by more than 100 forestry professionals and students from 29 countries, notes some of the impacts that plantations have on local communities, including loss of biodiversity, changes in the water cycle, decreased food production, soil degradation, loss of indigenous and traditional cultures, conflicts with forestry companies, decreased employment, expulsion of rural populations and destruction of the natural landscape. Carle and Holmgren are nothing if not consistent. They ignored the statement. On its website, FAO illustrates its press release about the “Wood from planted forests” report with a photograph of Veracel’s monoculture eucalyptus plantations in Brazil. The caption reads: “Industrial roundwood production from planted forests, Brazil”. We are left in no doubt that the “planted forests” that the FAO is talking about are in fact industrial tree plantations. But the FAO is silent on the impacts of Veracel’s plantations. Rather than continuing to ignore the evidence, FAO should listen to the people living with the impacts of plantations. FAO’s wilful ignorance must stop. 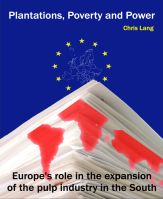 Chris Lang (2008) The Food and Agriculture Organisation: Promoting the lie of “Planted Forests, in Plantations, Poverty and Power: Europe’s role in the expansion of the pulp industry in the South, published by World Rainforest Movement. Jim Carle and Peter Holmgren (2008) “Wood from Planted Forests A Global Outlook 2005-2030“, Forest Products Journal, 58 (12): 6-18, December 2008. 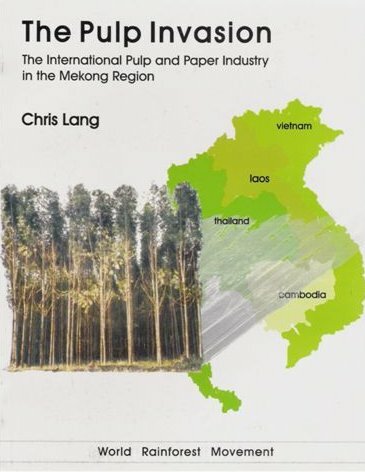 A good place for Carle and Holmgren to start looking for information on the impacts of industrial tree plantations would be Ricardo Carrere and Larry Lohmann (1996) “Pulping the South“, Zed Books. 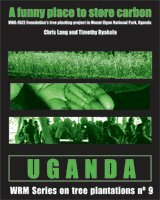 Then there’s WRM’s website and a series of WRM publications on plantations. Mike Garforth and James Mayers (Eds) (2005) “Plantations, Privatization, Poverty and Power: Changing Ownership and Management of State Forests”, Earthscan. Jeanette Clarke and Moenieba Isaacs (2004) “What role for forestry in reducing poverty in South Africa?“, International Institute for Environment and Development, page 4. 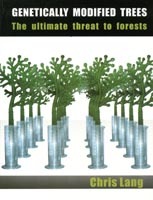 Christian Cossalter and Charlie Pye-Smith (2003) “Fast-Wood Forestry. Myths and Realities”, Center for International Forestry Research (CIFOR), Bogor, Indonesia, page 44. Cossalter and Pye-Smith point out that in New Zealand it was not market forces but government legislation that stopped logging in native forests. “Statement by forestry professionals and students“, WRM Bulletin 134, September 2008. WRM’s press release about the meeting (22 September 2008) is available here. “Rethinking the value of planted forests: Demand from industry and climate change mitigation increase planted forest potential“, FAO, 27 February 2009. Ivonette Gonçalves de Souza and Winfridus Overbeek (2008) “Responsible for Socio-environmental violations: Veracel Celulose, a company owned by Stora Enso and Aracruz“, CEPEDES, Brazil, page 101. I want to know what a typical A4 office paper ream (500 sheets each piece 5 grams) would have on the environment in Europe? What I want to have is a breakdown like they do on LCA’s of the carbon dioxide and other chemical footprint. Any idea if this exists? Thanks John. It’s a tricky question, because it depends where the wood was sourced (primary forest/plantations/secondary forest) and on the process used to produce the paper – as well as how far the various products were transported before being consumed (and what happens to the paper after it has been used). Having said that, you could look at the Shrink website and the Environmental Paper Network website which might give you some further pointers. Thanks for the links. Also I found out that David Mackay (Sustainable Energy – without the Hot air writer) suggests embodied energy of paper at between 3.2 kWh for really efficient per kg to 6 kWh for recycled to 10 kWh/kg for basic paper. If one assumes natural gas is being used as the main fuel in the UK (0.19 kg CO/kWh) then one can obtain a rough answer.